You may have heard of it. The independently self-published black & white comic book from GeekPunk that came out a dozen years ago that used to have the word “Super” in the title. Or, maybe you’re familiar with the webcomic at HeroHappyHour.com. 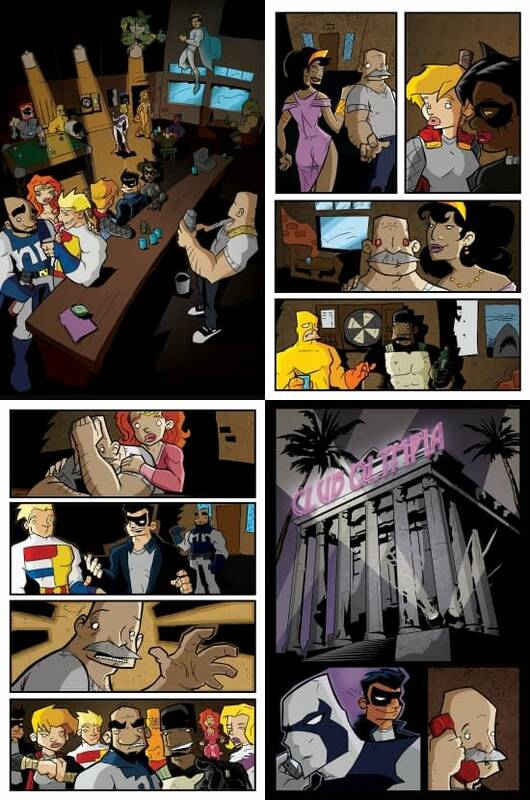 Either way, Hero Happy Hour is a comic about super heroes hanging out in a bar. “Cheers with capes,” it’s been called. Imagine pulling up a stool to the bar and sipping a frosty pint of your favorite beer as you listen in on the conversations of the “regulars” that frequent the neighborhood tavern. But, this establishment is unlike any other bar. The Hideout Bar & Grill caters to the super heroes of First City. And, it serves as more than just a place to wash away the troubles of serving and protecting society as crime-fighting crusaders. 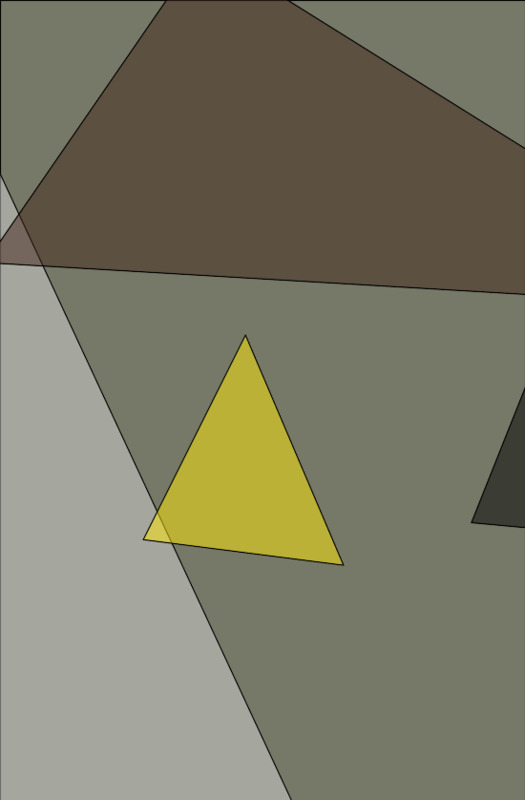 For the regular heroes it’s “a place where everyone knows your name…” secret identity or not. 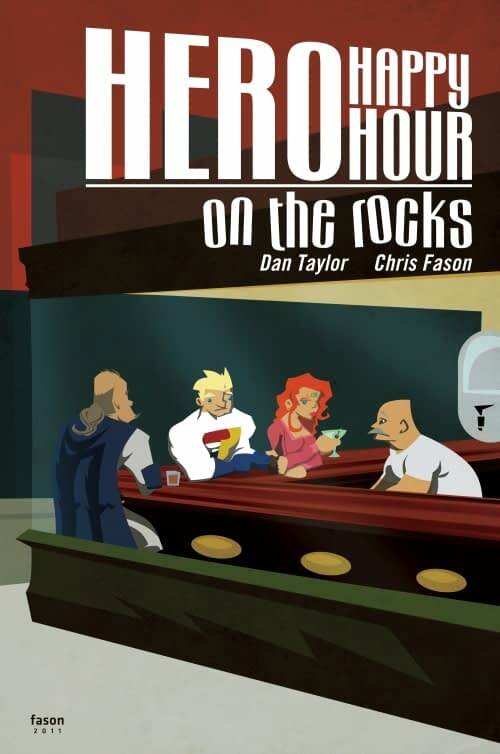 It’s been over eight long years since Hero Happy Hour has appeared in print, and now the comic’s co-creators Dan Taylor (writer) and Chris Fason (artist), along with Chris Barker (colorist), want to bring it back as a graphic novel trade paperback—in color even. The Hideout Bar & Grill is once again open for business! Rusty the bartender once again serves up specials for his super heroic clientele of regulars, including Guardian, Night Ranger, Scout, Psiren, and the other super heroes of First City. But, the happy hour is shaken when a new dilemma stirs up trouble, and the heroes begin to drop like flies. Is there a new threat slipping mickeys around the Hideout? Or, has an old foe returned for another round to declare “last call for Hero Happy Hour? We realize that there are a lot of comic book Kickstarter campaigns out there bidding for your hard earned cash. And, we applaud all of the creators that hope to fund their comic projects and get their unique labors of their love into the hands of readers. So, what makes Hero Happy Hour: On The Rocks so special? All bias aside, it’s a humorous book that pokes fun at the tropes, memes, and archetypes of the super hero genre. We’ve been making fun of super heroes for over a dozen years now, and the Hero Happy Hour universe has evolved to much more than the dimly lit dynamic dive of The Hideout Bar & Grill. There is now a rich history with of one gag bit characters that have developed into stars in their own right. We love these guys and gals of Hero Happy Hour. And, we think you will too. If the above heartfelt endorsement isn’t enough to convince you, how about if we offer you swag? Besides the opportunity to get your eyeballs on a truly funny super hero funny book, we’re tempting you with bumper stickers for your super rides or hero mobiles, buttons for your formfitting supers outfits, bottle openers to keep in your trusty utility belts, t-shirts featuring the dysfunctional duo of super hero Night Ranger and sidekick Scout, and limited quantity sketches by artist and co-creator Chris Fason of your favorite Hero Happy Hour characters. 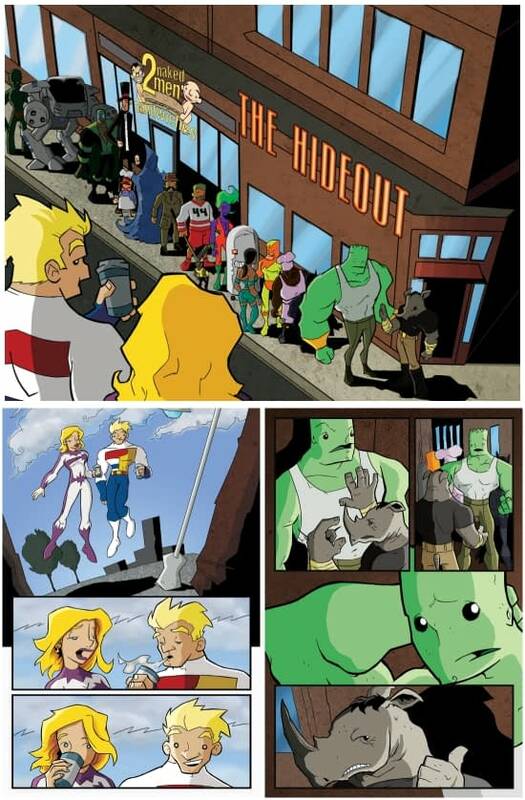 Chris and I (Dan) have been drawing and writing Hero Happy Hour for over a dozen years now. 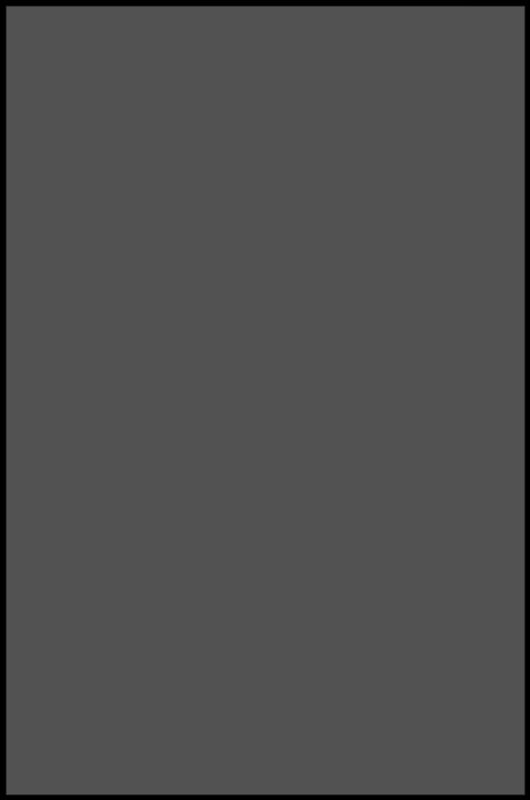 We were strangers when I answered his online ad at DigitalWebbing.com for an artist looking for a writer to collaborate with on a crime comic book. Well, we didn’t create a crime comic. We ended up creating a comic about a group of super heroes griping about their day-to-day lives of being crime-fighters based on a short film script that I wrote that put the characters seated at a bar so I wouldn’t have to worry about costumes from the waist down. We love these characters. And, we love the bar that they hang out in. But, we need your help to save The Hideout Bar & Grill. 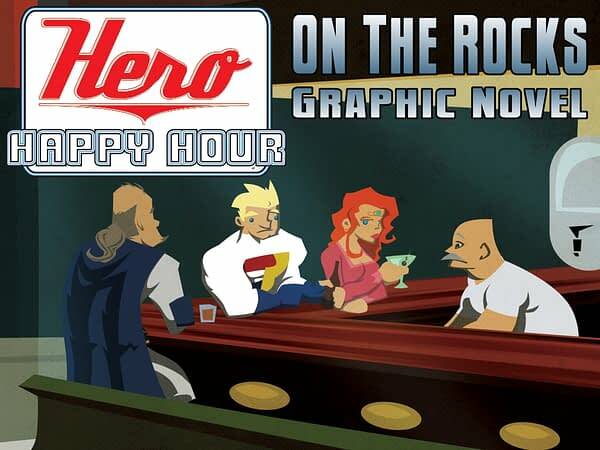 Please check out the Hero Happy Hour: On The Rocks – Graphic Novel Kickstarter and consider backing the project. Also, help spread the word and share on the social media outlets of your choice. 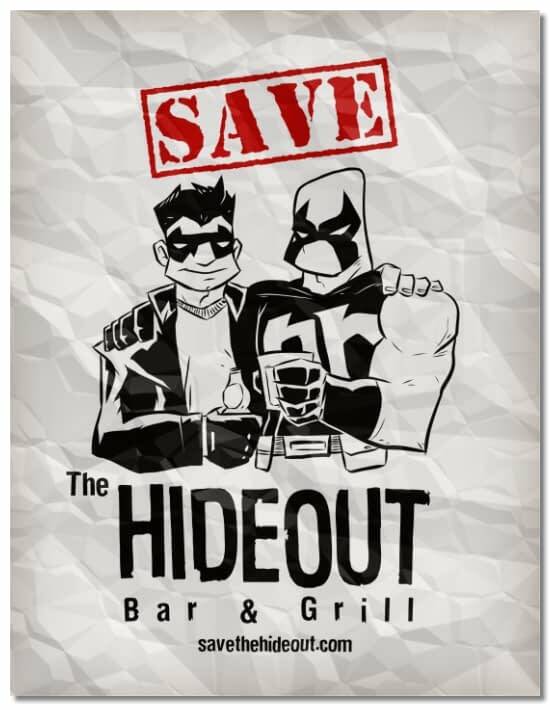 To help our cause, you can download a “Save The Hideout Bar & Grill” flyer, print it out, stick it up and/or display it somewhere neat or unique, take a picture and post that picture with the hashtag #savethehideout on your favorite social media outlet (Facebook, Instagram, Tumblr, Twitter, etc…). Thank you for your support. Cheers!